EFE photo bundles are available for sale through Creative Market. Browse the collections below and purchase the bundle that best fits your needs today! 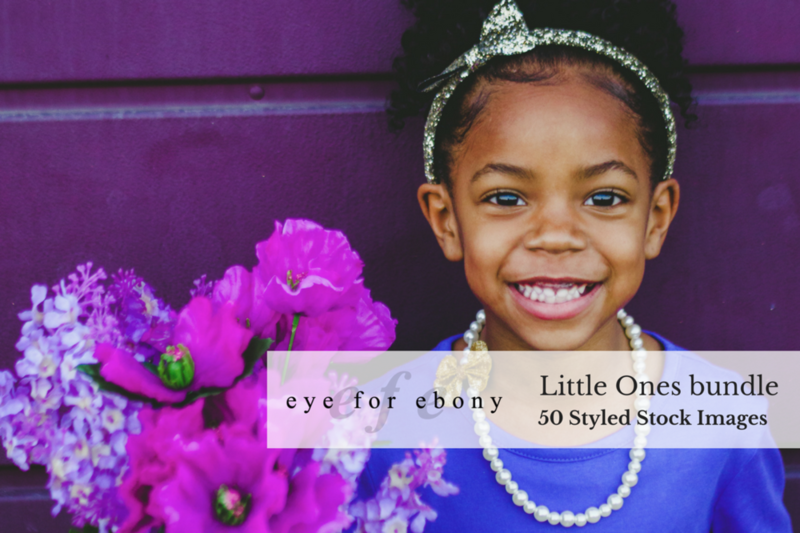 25 images - Our Eye for Ebony City Girl Bundle is a great fit for female entrepreneurs. The bundle features images taken in a urban, downtown setting in everyday casual clothes. Lots of negative space for text and a variety of expressions to fit any tone. 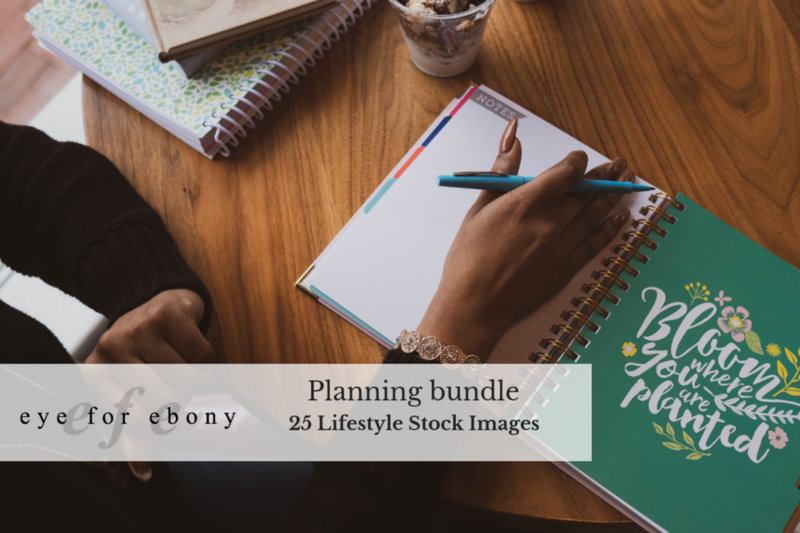 25 images - Our Eye for Ebony Planning Bundle is a great fit for strategists and coaches who are sharing tactics to start the year off strong. What's great about this particular bundle is we've included a lot of lettered props including a great planner which would work really well for Instagram content for African American influencers. 25 images - The EFE Work From Home bundle was shot in a beautiful urban, historic home in Downtown Lynchburg. The bundle features images of a woman working from home on a phone, reading and using her laptop. Perfect for female entrepreneurs to use for blog posts, ads or website headers. Lots of negative space to add text for graphics and make it your own. 50 images - The EFE Business bundle features four millennials working in a downtown loft office. The bundle includes images with the models by themselves with lots of negative space as well as group and duo shots. Our Eye for Ebony Queen Bundle has two aesthetics in one bundle to help provide entrepreneurs with more design options. The beige background makes it easy to cut the model out the background or add text to directly on top of the images. The black backgrounds add a level of drama that would be great for an eye-catching Facebook ad. 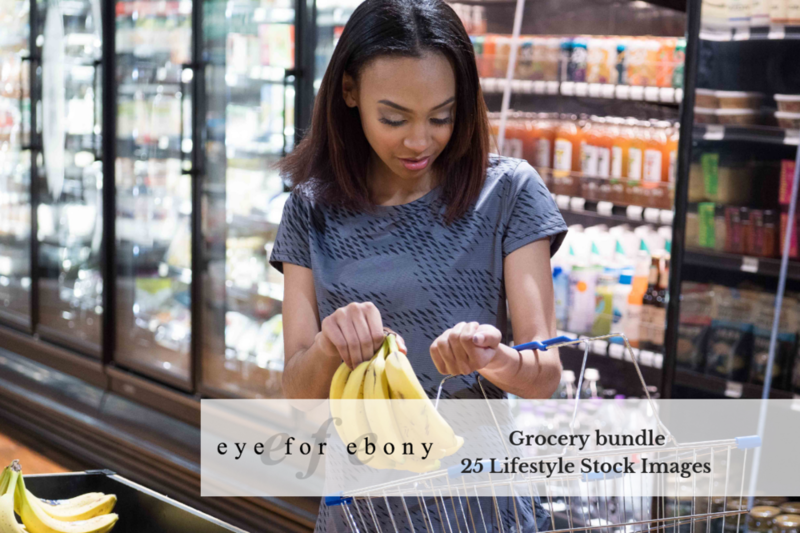 Our Eye for Ebony Grocery bundle is a great fit for healthy lifestyle bloggers. This bundle features images taken outside and inside a local grocery store downtown. Use this bundle to encourage your followers to eat organic or simply drive traffic to your healthy lifestyle business. 25 images - The EFE Father and Son bundle is a compilation of horizontal images taken on two separate photo shoots in urban outdoor locations. The bundle features images that portray the beauty of the father/son relationship with African American models. 25 images - The EFE Maternity bundle is an excellent fit for organizations that cater to mothers. Set in a blooming garden, the EFE Maternity bundle beautifully portrays pregnancy and motherhood. This bundle is also a great fit for Mother’s day promotions or graphics. All images featured in this collection are horizontal to allow for cropping if necessary and work great as website header images. 25 images - The EFE Coffee Shop bundle is the PERFECT solution for images of African Americans at work in a coffee shop. The colorful location adds visual interest helpful for developing high converting ads and offer plenty of negative space for text or overlay graphics. All images featured in this collection are horizontal to allow for cropping if necessary and work great as website header images. 50 images - These joyful images of young children at play were commissioned by Seeds for Success Affirmation Cards and made available for the Eye for Ebony community. They are perfect fit for bloggers, online business owners, or non-profit organization who are looking to promote positive messages for African American children. 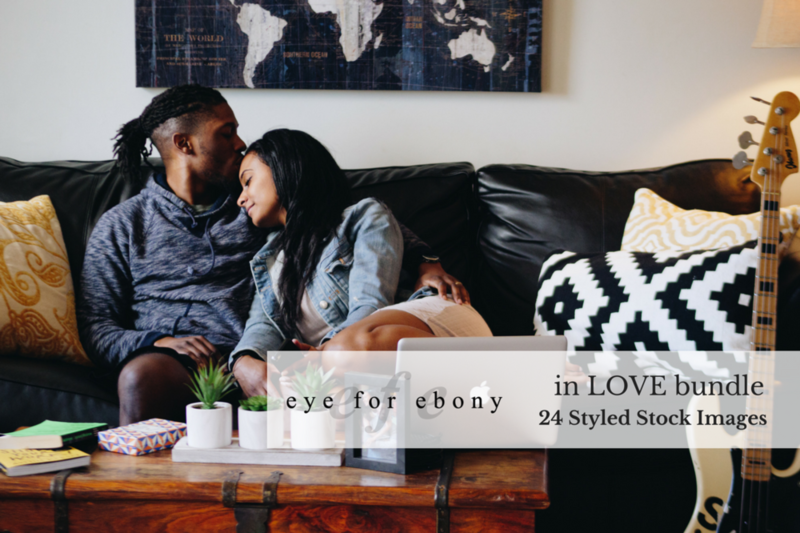 24 images - Our Eye for Ebony in LOVE bundle is perfect for marriage or love themed content. For this bundle we took the "couple in love" angle and styled these images in a downtown apartment. The millennial couple exudes young love and the variety of color grades make it perfect for brands of all types! 24 images - horizontal & vertical images available for instant digital download - Our Eye for Ebony Bible Reading bundle is perfect for faith-based bloggers, online business owners, or female entrepreneurs. A common New Years resolution is to spend more time with God, do devotions and read the Bible more. Use these creative images to encourage others in their pursuit to know God more. The Illuminated Bible and varying textures from the pennies to the wood grain add visual interest to the everyday task of reading. We even included a couple minutes of the Bible app in case your audience prefers to read on a mobile device!